Representation Matters in Fitness, Too. 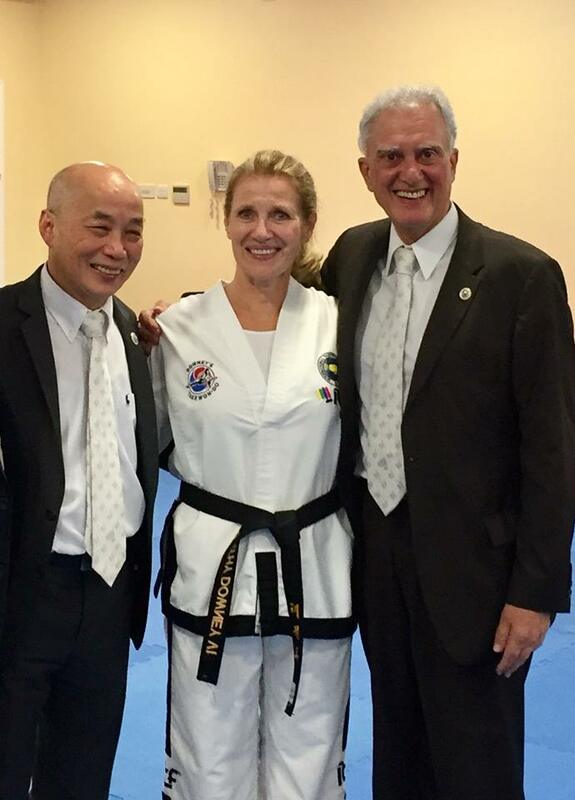 Last week, one of my Taekwondo instructors, Mrs. Cathy Downey, passed her 7th Degree black belt test. At that moment, she became MASTER Cathy Downey*, the first female ITF Taekwondo Master in Newfoundland and Labrador and one of only three female Masters in Canada. Here’s MASTER Cathy Downey, with Grand Masters Lan and Marano, right after her successful test in Dublin, Ireland. While I have always found her to be an inspiration, this latest accomplishment has really wowed me. I am fiercely proud of her for pushing forward in the male-slanted world of martial arts, and I have realized how much her competence and skill has paved the way for my development in TKD. I have always been a pretty determined person but I also have to have sense that there is a point to what I am pushing toward. If I were in a typical TKD school, most of the senior students would be men, as would most of the instructors. However, in my school, because of Master Cathy Downey, students have a female role model. Achieving higher ranks seems possible for the women in the class. We don’t have to be an exception, we can strive to be like Master D.
Like I said in my title above, representation matters in fitness, too. I am sure that we can attribute the sheer number of high ranking female students in our group to the fact that Master Cathy Downey is a vital part of our school. She shows us that women can do everything that we need to in order to excel at Taekwondo. And she does it without making us feel like an exception, she just assumes that we can do it. And because she is so clearly skilled and so obviously competent, she sets a precedent. The women in the class are also assumed, by everyone, to be skilled and competent. There is no sense that we are skilled ‘for a girl’, we are just skilled. We are learning, just like everyone else. Now that I have given it more thought. I’m a little shocked that I hadn’t really noticed this before. I knew how important Master D was to our school, but I hadn’t thought about her as a symbol before. I hadn’t realized that she is a marker of all that the other women can achieve. Thanks to her efforts, we don’t have to prove that ‘a woman’ can do these things, we can just do them to the best of our abilities. Obviously, some of us will be more skilled than others, but any challenges, or even failures, will not be automatically attributed to our gender. What incredible power there is in that. We can just BE. I wish that everyone could have this feeling in their chosen fitness activities. I would love for you all to have a sense that ‘someone like you’ – your gender, your age, your shape, your whatever – can do the activity that you want to do and excel at at it. How much better off would we all be if that were the case? What obstacles would be removed between you and your own version of fitness if you had proof that you could succeed? I know that I have a lot of people cheering me on at Taekwondo. I have incredible support from women and men alike. In my class there’s a terrific 16-year-old kid who seems to have taken me on as a personal project. He helps when when I mess up, coaches me through difficult new steps and kicks, all without condescension. (Thanks, Patrick!) There’s a team of high-ranking women above me who encourage me every week (Thanks, Sharon, Catherine, Joanne, Lynn & Lucinda). My friend Kevin helps me at every turn. Senior Master Scott Downey has an unwavering belief in my ability. All of that is amazing and encouraging, but watching Mrs. Downey work so hard to become Master Downey? That has added a whole new level of possibility for me and I love it. I have long known that representation matters but I had no idea the visceral impact representation could have until now. Because I have seen her do it, I can see *myself* doing it. I may be ‘only’ on my way to my third degree black belt but you can only do this one step at a time and Master Cathy Downey has lit the entire path ahead. Congratulations and thank-you, Master D.
I don’t mean for this post to diminish the effort that Senior Master Scott Downey puts in to ensure that our school supports and encourages female students. He is a major factor in our success and he works hard to create and maintain a respectful atmosphere. This post, however, is about how being able to SEE a woman reach such a high rank is important to the women in the class. *Because my TKD school is run by a married couple with the same last name, this post and future posts could get confusing. So, to clarify: My TKD school is run by a terrific couple, Scott and Cathy Downey. Master Scott Downey was a 7th Degree black belt when I started and has advanced to 8th degree in the past few years, becoming Senior Master Downey. Mrs. Downey was a 5th degree when I started, and has advanced to 7th degree in the meantime. Now my instructors are Senior Master Scott Downey (a.k.a. Master Downey) and Master Cathy Downey (a.k.a. Master D). Next Post (Guest post) Distance swimming– what is it good for? Everything! Thank you Christine for writing such a wonderful article. The thought hadn’t really occurred to me that I would be a role model but I am certainly happy if I could encourage any student, especially females, to be more confident and comfortable in their own skin. I have been getting a lot of feedback from women who are extremely proud of my accomplishment which made me really realize what a big deal my becoming a Master is. For that I am extremely proud. Thanks for reading my post, Master D. ❤ I'm glad you liked it. You are very encouraging and a terrific role model.